Home / Blog / Does my document look oversized in this? Size – it’s a big thing in the media these days. But in this case we’re not talking waistlines. Oh no, we’re far more interested in paper sizing. And as far as we’re concerned, the bigger the better! Because oversized document scanning is one of those things that is more complex than it might sound, and you know we love a challenge. We do ours on a Canon OCE large format scanner, which can scan in colour or black and white. It can deal with documents up to A0 in width and basically as long as you like (within reason – there’s a limit to the amount of physical space we have in the building so let’s not try and break any records, ok?). To give you an idea, we’ve done aircraft drawings that have been over 40ft long! We’ve also done drawings of nuclear power station parts, but we can’t tell you any more about that or we’d have to kill you. To start an oversized scanning job we actually have to alter the office layout, pulling the scanner away from the wall and rearranging the tables so as to allow the documents to feed through and out the other side. It’s a very manual process and takes a delicate hand (ideally two), especially since many of the oversized documents we deal with are quite fragile, for example if they’re printed on mylar or drawing paper. The Canon OCE scans at 300DPI (dots per inch) resolution rather than 200DPI, which essentially means that the images it produces – saved as either a TIF, PDF or JPEG – are of a higher quality. 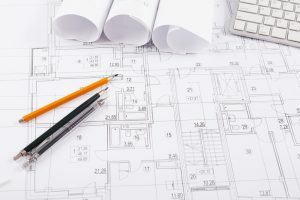 Which is pretty important given that most of the oversized documents we scan are things like architects plans, engineering plans, site plans (any plans, really), technical drawings and so on, which have to be very accurate at any scale. We can also scan documents up to 15mm thick, so original mounted prints will fit through – ideal for insuring artwork. A warning before we wrap this up (which we will do in a moment, because while we find the intricacies of scanning oversized document scintillating, we know not everyone does): don’t be tempted to fudge the process on your normal sized office scanner. There’s always one clever clogs who decides to chop up a schematic drawing, photocopy the individual pages and then glue them back together. Or scan sections and stitch them together digitally. This does not work. You inevitably wreck the scaling or end up with a crease line over an important bit of piping which means the new building you’re constructing will be flooded with sewage every time someone flushes the loo. If you need help making architect’s drawings, engineering drawing, vehicle schematics or whatever more portable, please ask us instead – we’re only too willing to help.